Once upon a time we get up for work, bathe, dress up, and go. And then some company HR introduced casual Fridays and all of a sudden, you find yourself staring at clothes thinking, "What is smart casual?" [firstpara] Funnily enough, when smart casual or even business casual was introduced in the United Kingdom nearly 10 years ago, even the people there were clueless. Some even arrived at the office wearing golfing gears, if not identical chinos. This ruling is supposed to make for a relaxed working environment because people are believed to feel less stressed and become more productive by dressing to express themselves. The formal definition of smart casual should come from the HR executives who spearheaded this madness. But from country to country the rules of smart casual vary greatly. In countries with a much cooler climate office workers come in coat and tie. Here in the Philippines, we get as close to a tie except when forced to wear a suit (formal events). And even then “formal” to a lot of Filipinos only connotes a tie. So if in the UK they are taking off the suit to define smart casual, what do we need to take off? Our shirt? You wish. No tees. Just remember to keep the collar. You have to have a collar. 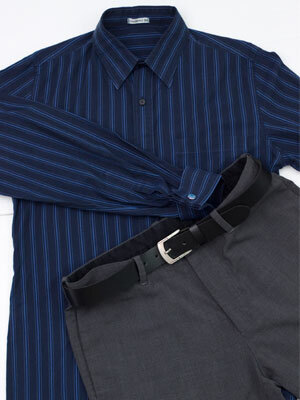 You may opt to wear your shirt minus the tie or tone down the design and play it safe in button-down short-sleeved shirt. Keep a tailored jacket handy just in case. Sure. Stay with regular or slim fit (not skinny!) but in dark washes, no rips, no prints, no super loose fit. It must always be accompanied with a leather belt. Avoid multi-pocketed cargo pants. If you love your regular office pants, you can still choose to wear them. If you want to try something else aside from jeans, khakis is a good option. Forego the trainers please. Imagine meeting a client in those. They won’t care even if it’s the latest Puma hi-cuts. Steer clear of combat shoes or sandals, too; they're just not smart enough. Think: casual that is ready to talk business should a client asks for an impromptu meeting. You’re safe in leather—loafers or lace up—that matches the color of your belt. And since we are not strict people by nature, clean Chucks or plimsols can also pass if worn with slacks or khakis. It’s called smart casual cool.